A page telling new owners about the hobby and what to expect. This page answers some the of most common questions we receive by new owners. A year-by-year listing of all models, commission numbers, options available and number made. A year-by-year listing of commission numbers including prefixes and suffixes. Lists for engine number prefixes, suffixes and sizes for Spitfires and other Triumph Models. Download a pdf file made from the training manual for Triumph mechanics. Ratios, Specs, lubes for your final drive (differential). Torque specs to general areas of the Spitfire. List of fluid (oil, anti-freeze, etc.) requirements and types (from 1975 Owners Manual). List of info for tune-up and timing specs your Spitfire and GT6. 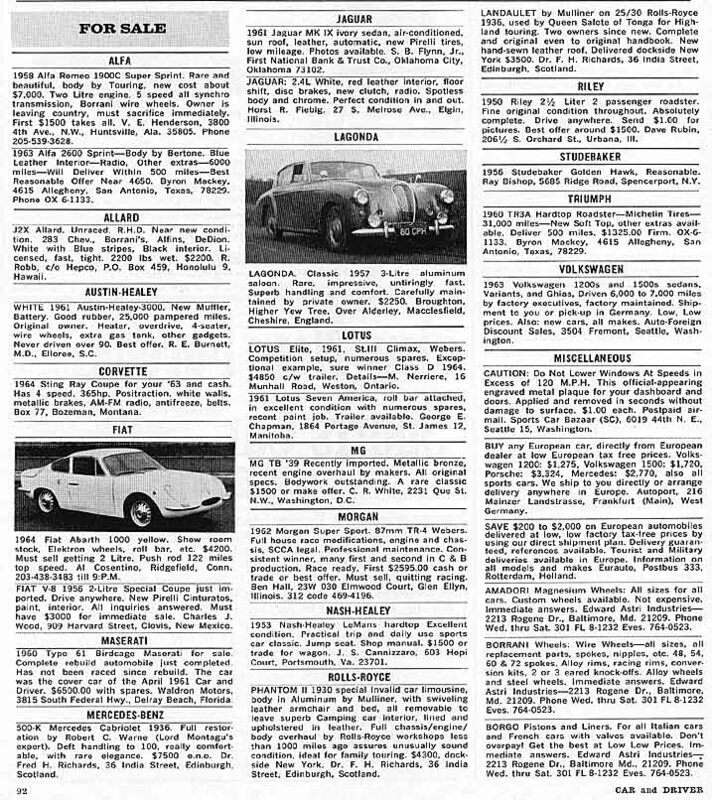 A comprehensive listing of maintenance performed by Triumph Dealers (from 1975 Owners Manual). This page lists substitutes for no longer available parts or interchangeablility between Spitfires, GT6's and other cars' parts. This page will stay in a constant state of construction. This page shows measurements for the factory luggage rack and another small version that was probably not factory. Describes the systems controlled by each fuse (from 1975 Owners Manual). Pages that contain photos of Spitfire & GT6's, carbs, wheels, engines, etc. Photos of various areas of the ignition system, relays, distributors, etc. Diagrams of instruments, switches and controls. Codes for the paint colors; find out what the color your Spitfire or GT6 was originally. This page discusses colors and locations of factory stripes. This page shows owner designed stripes. It also shows other color schemes such as British flag and other unique paint jobs. This page shows the locations of decals, and badges on your Spitfire/GT6. Under construction. This page shows and has links to pages that deal with body modifications for Spitfires and GT6's. List of info for tune-up specs your Spitfire. Some 1500 Spitfires have clearance problems between their manifolds causing vacuum leaks. This page lists problems with your gauges, blinker/flasher and other wiring problems and possible fixes. This page lists problems with your gauges and possible fixes. Testing of the standard Lucas Control Box or Voltage Regulator installed on all Triumph Spitfires (and many other models) that have a DC Generator. An informative page explaining why your car may need to be timed differently than the manual states. Photos of the ignition system, distributor, relays, etc. Pages scanned from the rebuild kit for ZS carbs. List of Sites that deal with Weber conversions, troubleshooting and tuning. This page shows diagrams for emissions systems for 75-80 cars. How to remove and replace that broken or scratched windshield. Information about making your car more fun. Don't bother looking for an easy way. Directions for building your own home-made rear hub puller. There are two different door clips holding door panels on 1500's. This page shows the specific location of each kind. Step by step instructions for installation from Monza. All you need to know to buy and install a roll-bar in your Spitfire. Care and proper lowering of your convertible top, from the 1975 Spitfire owners manual. Consumer Reports' Surprising Oil Test Results! Consumer Reports tests different oil brands and changing intervals. PDF file of the article from issue #9. Buy or sell cars, parts cars, parts or wanted ads, our new classifeds have many new features; advanced searches and the ability to update existing ads. Not happy with the power of your Spit? Change the engine! Other sites that feature engine swaps. Send a friend a card! There is nothing like the sound of a sports car! "You want how much for your MG?!" "I thought Maserati teamed up with Chrysler"
Results of all past "Quick Quizes"
Triumph, Spitfire bonnet and boot logos saved as vector EPS (Adobe Illustrator 5.0) suitable for hi-rez printing or sign companies. Available in both Mac & Windows formats.